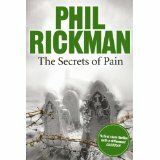 A book by Phil Rickman. Besides the wonderful characters and story-telling, what I like best about Phil’s work is the ongoing conversation throughout the series between religion and secular society, the subtle questions about the nature (and power) of belief. These are beautifully layered books, that can be re-read periodically—and the release of a new one is always a great excuse to go back and start all over with the first volume, THE WINE OF ANGELS. Which I propose to go and do, directly after I finish work tomorrow. Posted on Diana’s blog on January 10, 2012.